*The share price is the closing price on June 20. The number of shares issued was obtained by subtracting the number of treasury shares from the number of outstanding shares as of the end of the latest quarter. *The forecasted values were provided by the company. From the term ended Apr. 2016, net income is profit attributable to owners of the parent. Hereinafter the same applies. This Bridge Report outlines the results of ITO EN for the fiscal year ended Apr. 2018 and the outlook for the term ending Apr. 2019. ITO EN mainly manufactures and sells beverages (including green tea, coffee, and vegetable juice), and tea leaves, and also operates restaurants and conducts franchise (FC) business of Tully's Coffee, etc., manufactures and sells supplements via its subsidiaries. In Japan, the company has the largest share of 33% (as of Dec. 2017) in the market of green tea beverages, including "Oi Ocha." In addition, it owns a variety of popular product brands, such as "Kenko Mineral Mugicha" (healthy mineral barley tea) which is the bestselling caffeine-free tea beverage, "Ichinichibun no Yasai" (One Day Veggie), the most selling 100% vegetable beverage, and "TULLY'S COFFEE" which is the top-selling bottle-shaped canned coffee product developed in cooperation with Tully's Coffee Japan Co., Ltd.. Each of them has achieved an annual sales quantity of over 10 million cases ("Oi Ocha" has sold more than 80 million cases). The ITO EN Group is composed of 31 consolidated subsidiaries, including Tully's Coffee Japan Co., Ltd. and Chichiyasu Company, and 3 companies accounted for using the equity method. With the aim of becoming a "Global Tea Company," it is developing the brand and cultivating new green tea markets in the U.S. (mainly New York), Australia, China, and Southeast Asia. 【Management Principle "Always Putting the Customer First"】 【Five Concepts for Product Development since the Establishment of the Company】 【Outline of the business】 The business of ITO EN is classified into the Tea Leaves and Beverages Business, which manufactures and sells tea leaves and beverages, the Restaurant Business, in which Tully's Coffee Japan Co., Ltd. operates specialty coffee shops and FC business, and The Others, in which Mason Distributors, Inc. (Florida, the U.S.) manufactures and sells supplements. For the term ended Apr. 2018, the sales of ITO EN (non-consolidated) accounted for 84.1% of the Tea Leaves and Beverages Business (77.4% of consolidated sales). As for the composition of non-consolidated sales, tea leaves make up 9.3%, beverages 89.7%, and others 1.0%. 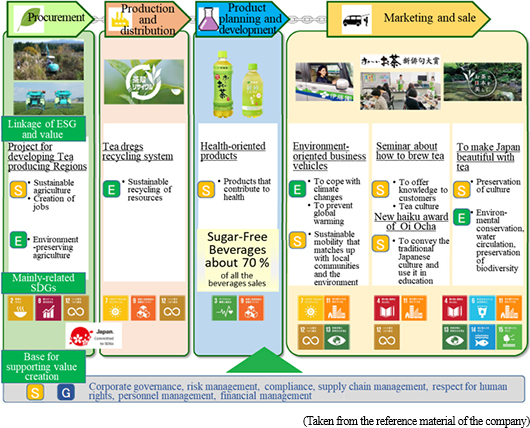 【A Unique Business Model - A Value Chain Corresponding to ESG】 One characteristic of the ITO EN business is that each step of the business flow (Procurement ⇒ Production/Logistics ⇒ Product planning and Development ⇒ Sales) satisfies ESG principles. In Procurement, the company is engaged in the Tea-Producing Regions Development Project in order to ensure the stable procurement of high-quality tea leaves. This activity is linked to sustainable agriculture (S), creating employment (S), and environment conservation type agriculture (E). In Production/Logistics, the sustainable resource utilization (E) is accomplished by Used Tea Leaves Recycling System ( recycling the post-production waste left by used tea leaves into products such as fertilizer and animal feed, as well as boards, resin, paper products, and building materials). In "Product Planning and Development," the company has made contributions through supply (S) of health-conscious products (products that contribute to health), as demonstrated by the fact that sugar-free beverages have accounted for 70% of ITO EN's beverage products. The company is also continuing ESG efforts in Sales. The company is tackling climate change response and global warming prevention (E), as well as introducing an Environmentally-friendly sales vehicle accounting for sustainable mobility in harmony with local communities and the environment (S). The company also provide knowledge to customers, tea culture through "How to brew tea" seminars (S) and passes along traditional Japanese culture and utilize for education by the "ITO EN Oi Ocha New Haiku Contest" (S). In addition, the company further promotes its activities in the fields of culture preservation (S), environment conservation (E), and water circulation/conservation of biodiversity (E) via the "Making Japan Beautiful Through the Tea." campaign. It also teams up with the "TABLE FOR TWO" for the "Oi Ocha and Onigiri (Rice ball) Action" (S). 【Tea-Producing Regions Development Project - Stable Procurement of Tea Leaves and Contribution to Society】 In Japan, the number of agricultural workers has decreased due to the aging population and lack of successors, and the number of abandoned fields is growing, while the land used for tea farms continues to shrin-0 k. Furthermore, as many as 30% of tea farms are more than 30 years old. To address these problems, ITO EN initiated the tea-producing regions development project in order to contribute to the community by making use of abandoned farmland, training the next generation of agricultural workers, and creating jobs; and to secure a stable procurement of higher quality ingredients for tea. In the term ended Apr. 2018, the company launched "The Large-Scale New Tea Farm Business" in Saga Prefecture (the fifth target prefecture after Oita, Nagasaki, Miyazaki, and Kagoshima). The company is supporting the operation of tea farms and crude tea production factories by utilizing agricultural corporations established by transportation and warehousing companies. Furthermore, contract cultivation of Tencha, a raw material used in Matcha (powdered green tea), with tea farmers in several areas, such as Kyoto and Kagoshima prefectures, is currently in full-scale deployment. ITO EN's high-quality Matcha, produced based on its unique processing techniques, is characteristically fresh (with a vibrant green color) and rich in flavor, and used for a wide range of applications. The company's Matcha plays a part in enlightenment activities regarding green tea in overseas markets, tripling the sales volume abroad in the past three years. Sales and operating income increased 4.0% and 1.2%, respectively, year on year. According to the reference material of ITO EN, the beverage market (quantity) in 2017 stood at 3,770 billion yen, unchanged from the previous year due to unfavorable weather, such as typhoons and continuous rain, from August onward, with thirst-quenching beverages, in particular, showing low growth. Sales of the Japanese tea market rose 3% following product upgrading by each company. The coffee beverage market exhibited a 1% decline due to the influence of poor sales of short cans while 500-ml plastic-bottled coffee beverages and bottle-shaped canned coffee beverages performed well. The vegetable beverage market grew 16%, as driven mainly by the strong sales of tomato juice. Consolidated sales of the ITO EN Group, including overseas subsidiaries, grew 4.0% year on year to 494,793 million yen, out of which sales of ITO EN (non-consolidated) were 383,212 million yen, up 3.1% year on year. The company has developed an easy-to-use beverage market by securing hanger hook selling areas in supermarkets and through the effects of "ITO EN Dai-Cha-Kai" (demonstration sales and tasting events of green tea) held by the company's employees with tea taster certification, resulting in a sales increase of tea leaves by 6.0% year on year. In addition, sales of other products rose 10.5% year on year with powdered Aojiru products (mainly made from Kale or Barley Grass), such as "Mainichi Ippai no Aojiru," as a leading force. 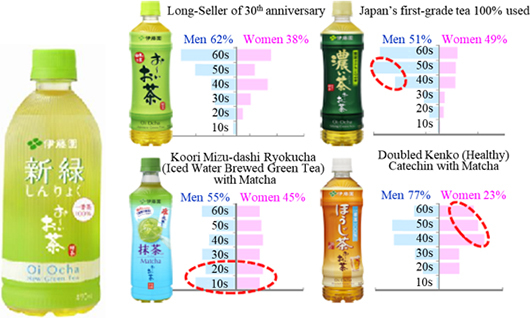 Major beverage products yielded satisfactory results, as demonstrated by a sales increase of "Oi Ocha" by 2.6% year on year, a 2.5% year-on-year rise in sales of "Kenko Mineral Mugicha," the top selling caffeine-free tea beverage, 3.7% year-on-year sales growth of "TULLY'S COFFEE," the bestselling bottle-shaped canned coffee product, a 2.0% year-on-year sales increase of "Ichinichibun no Yasai," which is the top-selling 100% vegetable beverage, and a year-on-year rise of sales by 6.4% regarding vegetable beverages, such as "Tonyu de Maroyaka - Mainichi Ippai no Aojiru." On the other hand, sales of short canned coffee products sold through vending machines and functional drinks shrank. Meanwhile, concerning subsidiaries, the US Business performed satisfactorily (sales increased by 15.3% year on year on a yen basis). Overseas sales grew 15.8% year on year to 40,362 million yen, and sales in Japan stood at 104,722 million yen, up by 1.2% year on year thanks chiefly to Tully's Coffee Japan, Co., Ltd. (with sales going up 7.7% year on year). Operating income was 22,043 million yen, up by 1.2% year on year. Gross profit rate declined by 0.2 point due to changes in the product configuration. While sales were poor from the summer through the fall because of unfavorable weather, selling, general and administrative (SG&A) expenses increased by 3.7% year on year because of a rise in selling commission (up 3.3%) due to enhanced marketing activities following new product release, an increase in freight costs (up by 9.6% year on year) caused by the growing sales volume, and growth in depreciation and amortization (up 5.4% year on year), but the SG&A expenses were offset by a sales increase. The decrease of ordinary income is attributed to foreign exchange fluctuations (from marginal gain of 205 million yen in the term ended April 2017 to marginal loss of 347 million yen in the tern ended April 2018). The reason for the significant rate of decline in net income is a drawdown of the "deferred tax asset" incidental to the U.S. tax reform (with a U.S. tax effect of -829 million yen). The total assets as of the end of the term shrank by 1,225 million yen from the end of the previous term to 301,180 million yen due to decreases in interest-bearing debts and lease obligations. Equity ratio was 47.3% (44.8% at the end of the previous term). Operating CF dropped due to a cut-off error that pushed settlement of trade receivables to May because the end of the term was a holiday. While expenditures for investing CF rose due to an increase in equipment investment through the switch from leasing of vending machines to owning of them, the company secured free CF of 13,963 million yen. Sales will exceed 500 billion yen! It is expected that sales and operating income will grow 2.6% and 4.3%, respectively, year on year. Sales are estimated to be 507.8 billion yen, up 2.6% year on year. It is projected that the beverage market (quantity) will rise 1% year on year to 3,800 billion yen in 2018. With regard to ITO EN, sales of tea leaves are expected to grow 7.5% year on year, hitting a record high. In addition, new products will make contributions, and sales of various beverage products will increase in a balanced manner, including not only "Oi Ocha" that will mark its 30th anniversary of the launch in February 2019, but also vegetable beverage, such as "Ichinichibun no Yasai" and "Mainichi Ippai no Aojiru," and coffee products in which declining sales of short canned coffee will be offset by sales of 500-ml plastic-bottled coffee, such as "TULLY'S COFFEE." Operating income will stand at 23.0 billion yen, up 4.3% year on year. In addition to a decrease (by 0.1 point) in the gross profit rate due to high costs of raw materials and other materials, it is forecasted that advertising costs incidental to release of new products will increase and freight costs will be on the rise due to a growing sales volume, but they will be offset by an increase in sales. It is also anticipated that both ordinary income and net income will turn to grow because transient factors will be eliminated. Oi Ocha The reference material of ITO EN suggested that the green tea beverage market was 440.0 billion yen in 2017 (compared with 435.0 billion yen in 2016). With a focus on "Oi Ocha," the bestselling green tea product, the company maintained its share of 33% in the market. In addition, "Oi Ocha - Hojicha" (Roasted Green Tea), on which the company is focusing as an effort to further encourage people to drink tea in summer, performed well, showing double-digit growth; however, while "Oi Ocha, " "Oi Ocha - Koicha" (Strong Green Tea), and "Oi Ocha - Hojicha" (Roasted Green Tea) have had a deep-rooted presence in the markets of 40s and older, customers in their 10s to 30s were not necessarily attracted to the products. Although the aforementioned 3 beverage products are characterized by the umami originating in tea leaves and the taste rich in aroma, the reason behind the weak presence in young generations is that such customers, especially women, seek for sweetness and mild taste in green tea products. Therefore, ITO EN released "Koori Mizu-dashi Ryokucha" (Iced Water Brewed Green Tea) in the spring of 2017. "Koori Mizu-dashi Ryokucha" is a green tea beverage with Matcha grown in Uji, Kyoto prefecture, one hundred percent. The features of the beverage include the sweetness of green tea brought out carefully through the "iced water brewing" process and the vibrant emerald green color, earning a certain degree of reputation from customers in their 10s and 20s. With "Oi Ocha" marking its 30th anniversary of the launch in February 2019, ITO EN released "Oi Ocha - Shinryoku" on May 1, 2018 in an attempt to further expand its customer base. The company uses first-grade tea, which is produced in Japan and rich in flavor, one hundred percent for the beverage, characterizing the product by a refreshing, mild aroma and a sweet and clean aftertaste. According to a consumer purchases survey (from May 1 to May 15), female customers accounted for 50.4% of all purchasers, and 20% of them were in their 20s and 30s. The product has earned good reputation in terms of its "mild taste" and "sweetness," and women, in particular, have seemed to put a high value on "Oi Ocha - Shinryoku" for its package design and size. Kenko Mineral Mugicha In the barley tea beverage market which is reaching 100.0 billion in scale and keeps growing, ITO EN has had share of 47%, and one of its caffeine-free tea beverages, "Kenko Mineral Mugicha" (healthy mineral barley tea), has gained the greatest share (on a quantity basis). Meanwhile, the scale of the barley tea leaf market has remained at around 16.0 billion yen. The company is taking a lead in the market through various approaches, such as mineral-added beverage products (other companies have released barley tea products with minerals added), securing market share of 43% with a focus mainly on Easy-to-Use Tea products, such as tea bags and instant tea. ITO EN is proposing full-year mineral supplementation via barley tea, by keeping in mind mineral supplementation while playing sports and water supplementation in the fall and winter, as well as precautions against the heat in the spring and summer. TULLY'S COFFEE and vegetable beverages For Coffee Beverage, while the market for the traditional-sized short cans (126-200 ml) has been shrinking, the market for 201-599-ml cans, pioneered by ITO EN through "TULLY'S COFFEE," is growing. Furthermore, following the expansion of the market of 500-ml plastic-bottled coffee, the company released new products, including black coffee and cafe latte, by redesigning their respective bottle packages in March 2018. With regard to the 100% vegetable beverage market, in which ITO EN has secured the greatest share of 39% mainly with "Ichinichibun no Yasai" (One Day Veggie), the market scale grew to 87.0 billion yen in 2017 from 71.6 billion yen in 2015 with tomato juices, which reportedly lower the blood-glucose level, as a leading force, and is expected to rise to 92.0 billion yen in 2018. ITO EN has strengthened sales activities for "Ichinichibun no Yasai" through a multitude of approaches, such as cooperation with nationally certified nutritionists, since the term ended April 2018. Also, the "Mainichi Ippai no Aojiru" beverage performed satisfactorily. By making a sugared version and a sugar-free version available, the company is increasing sales of "Mainichi Ippai no Aojiru," whose appeal includes not only "healthy" but also "delicious," in both categories of Aojiru juice and powdered Aojiru. Tea leaves/Matcha The market of green tea leaves (including Packaged Tea Leaf, Leaf, and Easy-to-Use Tea) was 234.3 billion yen in 2017. Although the market scale continues shrinking on a gradual basis, this decrease is present only in the Packaged Tea Leaf and Leaf markets, and the market of Easy-to-Use Tea products, such as tea bags and instant tea, in which ITO EN has held overwhelming market share, is booming (28.4 billion yen in 2017). Furthermore, the company secured hanger hook selling areas in supermarkets by enriching its product lineup, successfully increasing sales of Packaged Tea Leaf products. In the green tea leaf business, the company focuses on revitalization of the green tea leaf market and enlightenment activities through various approaches, such as "ITO EN Dai-Cha-Kai" held by its employees with tea tasters based on "ITO EN In-house Qualification Examination of Tea Tasters" (Registration No. 1, In-house Qualification Examination Program by the Ministry of Health, Labour and Welfare) (2,160 employees have been certified). In addition, sales of ITO EN Matcha are increasing both in Japan and overseas through its strengths of development of tea-producing regions and ITO EN's unique clean processing facility. The sales volume in overseas markets has tripled in the last 3 years. Toward establishment of a coffee value chain By cementing cooperation with Tully's Coffee and Distant Lands Trading Co. (located near Seattle, Washington, U.S.; hereinafter referred to as DLTC), like in the green tea business, ITO EN will improve quality and brand awareness both in Japan and abroad by establishing a supply chain from farms through products. Using coffee beans cultivated in the company-owned farms, DLTC engages in wholesale for private brands, such as GMS, and restaurants and has been granted "Rain Forest Alliance Certification" for its own farms and bean picking plants. In the term ending April 2019, Tully's Coffee is scheduled to open 40 new shops and close 15 shops, and it is predicted that the number of shops at the end of the term will grow by 25 to 731. As there is still significant room for opening shops, ITO EN plans to expand its store network through careful selections. Rain Forest Alliance (with the headquarters located in New York, United States) is an international non-profit organization founded in 1987 with the aim of maintaining tropical rainforests for global environment conservation. It grants "Rain Forest Alliance Certification" only to farms that have met its stringent requirements, such as protection of forests and ecosystems, maintenance of soil and water resources, improvement of the labor environment, and life security (which means that it is judged that certified farms have complied with the criteria requiring sustainability). Global strategy "Oi Ocha" has been steadily penetrating in the global market, and sales in overseas markets in the term ended April 2018 grew 21.7% and are expected to rise by about 20% in the term ending April 2019. In addition, sales of "MATCHA GREEN TEA," a global tea bag brand product which ITO EN released in 2015, increased 30% in the term ended April 2018, and it is projected that sales of the product will grow 20% in the term ending April 2019. The number of retail stores at the end of the previous term was 48,000, and the company plans to expand the number to 70,000 within this term. ITO EN will increase its presence as a "Ochaya" (teahouse) in global markets. Management With "sustainable growth" being put first, the company will accelerate business expansion overseas while further strengthening its domestic businesses. Regarding the businesses in Japan, ITO EN will develop around 2 product brands whose annual sales quantity will exceed 10 million cases, as well as enhance the existing brands with a focus on the 4 product brands whose annual sales volume being over 10 million cases. Furthermore, while increasing profit ratio, the company will certainly secure the largest market share in each category. As for business expansion abroad, ITO EN will realize double-digit growth mainly in North America and strengthen sales in China and Asian countries (it is preparing for business expansion to other areas than the aforementioned countries). The company will pursue group synergy as well. It strives to increase ROE and projects that ROE will grow to 9.5% in the term ending April 2019 from 9.0% in the term ended April 2018. Laying stress on promotion of sustainability management, the company will enhance its efforts regarding governance and CSR/CSV. The company's immediate goal is to achieve "sales of 600 billion yen, an ROE of over 10%, and a total return ratio of over 40% in the term ending April 2022" as cited in the medium-term business plan (from FY April 2018 to FY April 2022) that is in progress. ITO EN will endeavor to become a "Global Tea Company" while fortifying its business bases in Japan by establishing a position as a comprehensive beverage manufacturer and developing new businesses. In addition, it will focus on educational activities for sugar-free green tea by nurturing world-class tea tasters. A value chain corresponding to ESG As a management foundation, ITO EN has set up a value chain that corresponds to Environment, Society and Governance (ESG), with its business flow (Procurement ⇒ Production/Logistics ⇒ Product planning and Development ⇒ Sales) corresponding to ESG. Its unique "Used Tea Leaves Recycling System" is also part of the value chain, and the company has developed a total of 100 kinds of used tea leaves recycling products, including tatami mats and building materials, resin products, and cardboards for storing "Oi Ocha" plastic bottles, using used tea leaves generated through the production process. In cooperation with MIZUNO Corporation (security code: 8022), ITO EN has developed Field Chip "Greentea" using used tea leaves. Field Chip "Greentea" is used as a filler for artificial grass, which can reduce the surface temperature by about 7℃, compared with existing fillers. It has been utilized in the outdoor field of "Asolete AFTER SCHOOL" in Mizuno Sports Plaza Senju and is scheduled to be sold nationwide by Mizuno starting on July 2. In the term ended April 2018, although sales increased 4% year on year, operating income grew 1.2% year on year to 22.0 billion yen (compared with 21.7 billion yen in the term ended April 2017) due to a decline in the gross profit rate following changes in the product configuration and a rise in SG&A expenses, falling below the initial forecast of 22.6 billion yen. SG&A expenses rose 7.6 billion yen because mainly of labor costs of 1.4 billion yen, selling commission of about 2.6 billion yen, and freight costs of 1,250 million yen. In comparison with the initial estimates, SG&A expenses went up by 2.0 billion yen due primarily to selling commission of 1.5 billion yen and freight costs of 1.0 billion yen. It can be pointed out that selling commission and freight costs suppressed year-on-year growth of operating income, and therefore operating income fell below the initial forecast; however, freight costs should be considered by adding selling commission and advertising costs since freight costs play a role as sales activities to some extent. A total of the three expenses was up by about 3.4 billion yen from the previous term and by about 1.8 billion yen from the initial estimate. As described above, in 2017, the sales of the beverage market (quantity) were 3,770 billion yen, unchanged from the previous term due to sluggish demand from August onwards caused by unfavorable weather, and thirst-quenching drinks, in particular, showed poor growth. Amid such circumstances, although the Japanese green tea market rose by 3% as each leading company upgraded their beverage products, this increase was achieved while sales competition heated up. The declining demand due to unfavorable weather and the fierce sales competition with major companies forced ITO EN to strengthen its sales activities. The company cannot allow itself to leave the high inventory level as it is, considering the product strategy, such as new product release in the next term, and besides, it has to make investment in order to secure shelving allocation and maintain the largest market share under intensifying sales competition. Even if the same amount of sales is yielded, the amount of profit will differ between when products are sold under strong demand and under slowing demand. As a result of the investment, however, while the green tea beverage market in the term ending April 2019 (2018) is reaching the record high of 445.0 billion yen achieved in the term ended April 2006 (year 2005), it is estimated that the company's market share will grow by 5 points from the term ended April 2006 (29%) to 34% and by 1 point from the previous term ended April 2018 (year 2017; 33%). It is vital to deliver results for each accounting period, but more importantly, ITO EN has never wavered in its management ethos that has put "sustainable growth" first. This report is intended solely for information purposes, and is not intended as a solicitation to invest in the shares of this company. The information and opinions contained within this report are based on data made publicly available by the Company, and comes from sources that we judge to be reliable. However, we cannot guarantee the accuracy or completeness of the data. This report is not a guarantee of the accuracy, completeness or validity of said information and or opinions, nor do we bear any responsibility for the same. All rights pertaining to this report belong to Investment Bridge Co., Ltd., which may change the contents thereof at any time without prior notice. All investment decisions are the responsibility of the individual and should be made only after proper consideration. Copyright(C) 2018 Investment Bridge Co., Ltd. All Rights Reserved.